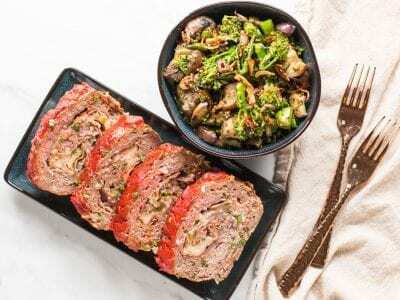 The best low carb meatloaf recipe for the keto diet stuffed with mozzarella cheese & prosciutto. Served with blistered japanese eggplant and broccoli for the ultimate low carb keto meal. 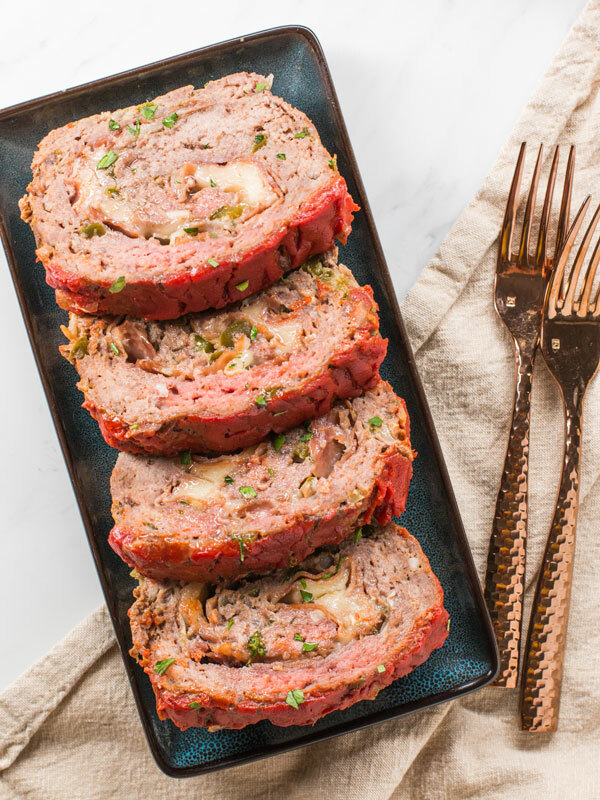 I’ve got a provolone and prosciutto stuffed meatloaf recipe that could be the best one yet. What makes this meatloaf so unique is that you lay the ground beef /filling out flat, stuff it with the cheese and prosciutto, and then roll it up back into the shape of a loaf. 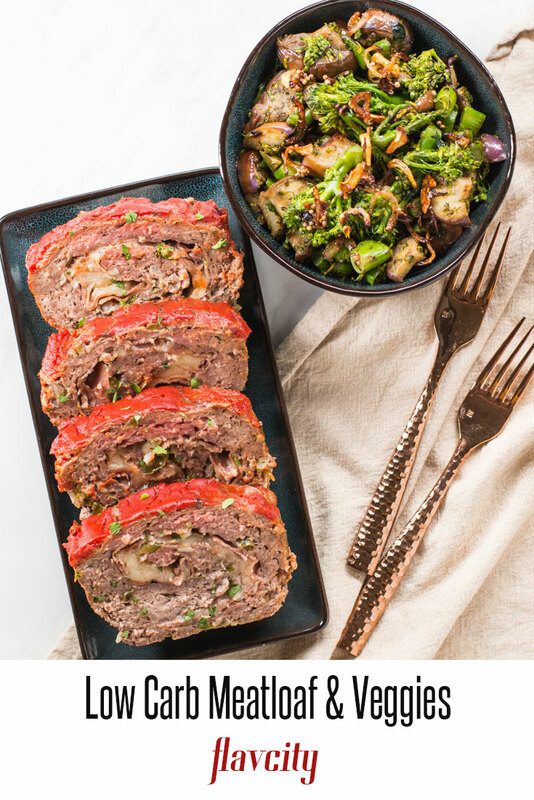 This creates layers of flavor and makes for the juiciest low carb meatloaf recipe that is perfect for the keto diet! 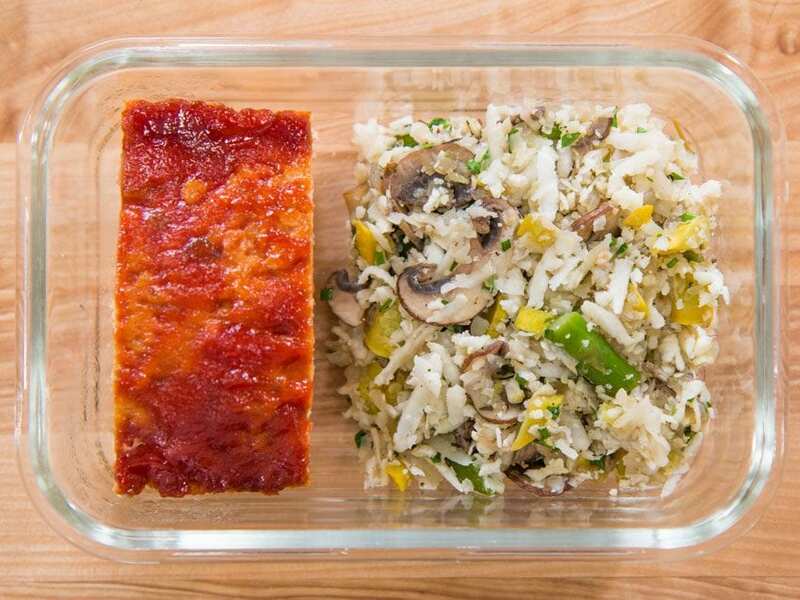 If you are looking for more meatloaf recipes, check out my turkey meatloaf with cauliflower rice pilaf recipe and this chicken shawarma meatloaf. It’s is easy to make a low carb meatloaf. 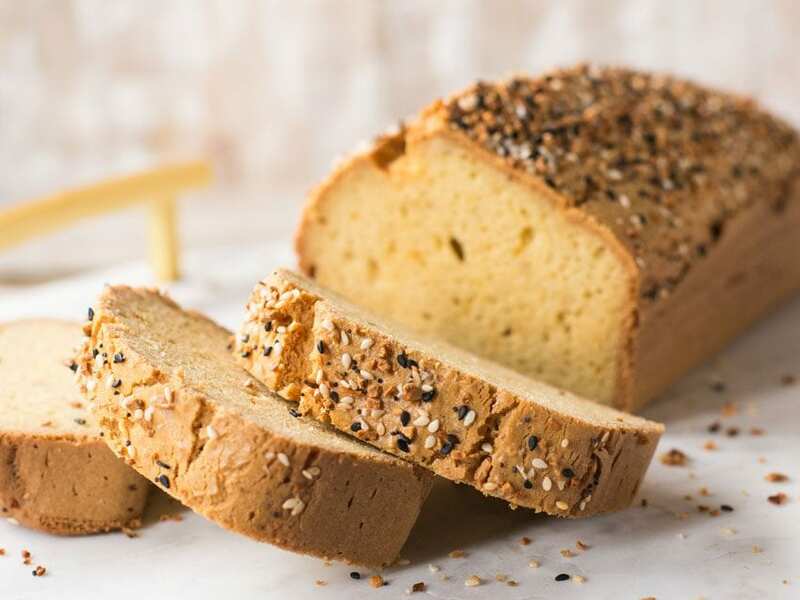 Just leave out the binder that normally comes in the form of breadcrumbs and make sure to substitute that with moist and soft veggies. 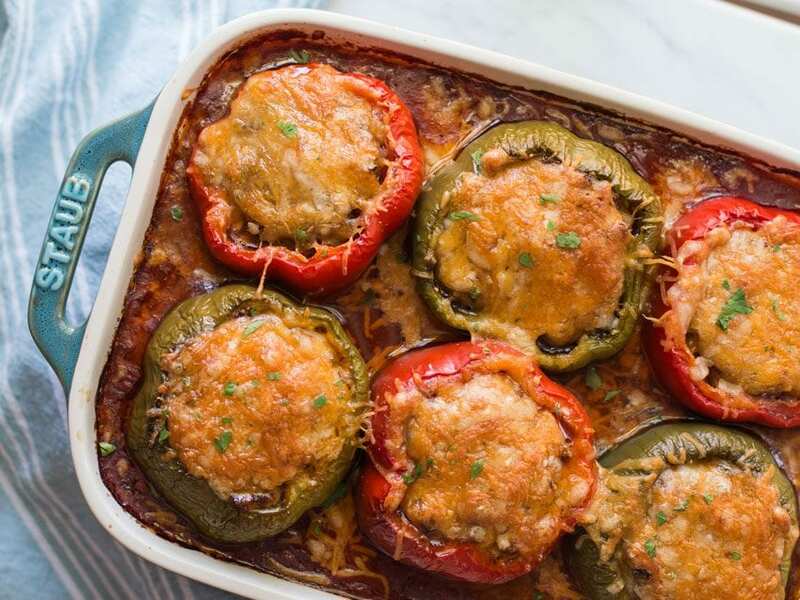 You have to use keto friendly veggies for a low carb meatloaf, so stay away from carrots and opt for green peppers, a little sweet onion, and garlic. I am a firm advocate for cooking the raw veggies before adding to the ground beef mixture. The one time I did not do this was on Food Network’s Cutthroat Kitchen and I got sent home. The raw veggies have too much moisture and a very strong flavor, so you want to take a good 15 minutes to cook them down and make them soft. Cook the veggies in a pan for a good 15 minutes or until soft and wilted. Combine that with two pounds of ground beef, 2 eggs, and some grated Parmesan cheese. Here is the best part of this keto meatloaf, spread it out on a piece of parchment paper, and layer pieces of sliced mozzarella and prosciutto over the top. Then use the parchment paper to roll up the meatloaf and place it in a tin. This will create that pinwheel look when you cut into the meatloaf later on. If you want your meatloaf to be soft and moist, you have to make sure to to over mix the beef and the ingredients. The longer you mix, the harder the meatloaf will get while it cooks, so make sure to combine just until everything is incorporated. How Do I Cook Japanese Eggplant? The Japanese eggplant is less bitter than the large purple variety. That is because it has less seeds. The key to making the eggplant and broccoli tender and slightly blistered on the outside is a very hot pan. First I fry the aromatic in the oil to infuse their flavor, then I put the sliced Japanese eggplant and blanched broccolini in the pan set just under high heat. This will create nice texture on the veggies and prevent them from getting mushy. Once ready, top the eggplant and broccolini with the crispy shallots and garlic and you have one tasty side dish to compliment the meatloaf. 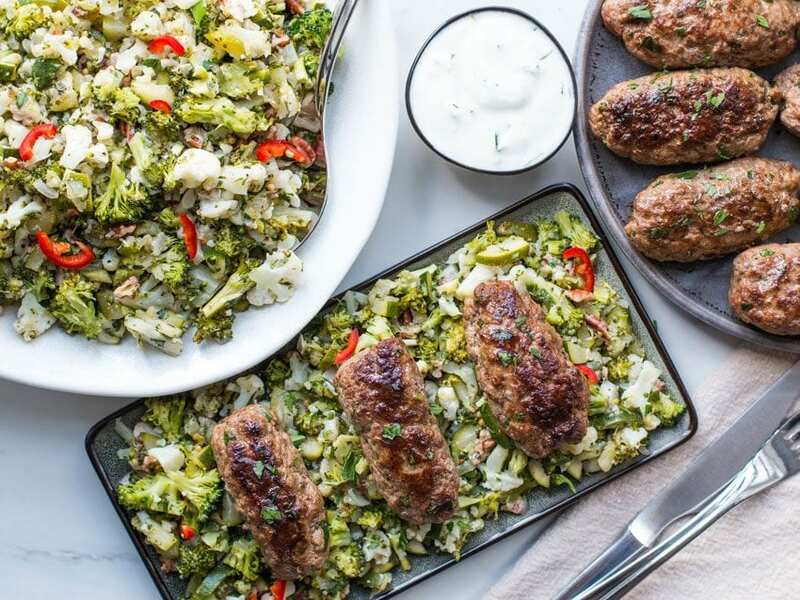 This ground beef kefta with low carb veggie pilaf is 100% keto and full of flavor. This salisbury steak meal prep is fantastic. You can make a few modifications for keto. This beef lettuce wrap with sesame peanut noodles is low carb and awesome. This low carb meatloaf recipe is stuffed with mozzarella cheese and prosciutto before being baked in the oven. Served with Japanese eggplant and broccoli for some really tasty keto meal prep. Pre-heat oven to 350 F for the meatloaf. Pre-heat a large non-stick pan over medium heat along with 2 teaspoons of oil. Add the onions, green peppers, thyme, ¼ teaspoon salt, and a few cracks of pepper. Cook for 10 minutes, stirring often. Add the garlic and cook another 5 minutes, or until the veggies are very soft. Meanwhile, add the ground beef to a large bowl along with the eggs, parmesan, 1 teaspoon salt, and a few cracks of pepper. Once the veggies are ready, add them to the bowl with the beef and use a large spoon to start mixing, the veggies will be too hot to handle(too cold to hold 😉). After mixing for 20 seconds use your hands to thoroughly mix everything together, but make sure not too overmix or the meatloaf will be tough. Use a piece of wax paper or parchment paper and measure an 9x10 inch rectangle. Spread the meatloaf mixture onto the paper and shape it so it fits 9x10 inches. Layer the cheese and prosciutto so they overlap on the meatloaf and then use the paper to roll the meatloaf up tightly, watch the video above to see how my wife does it. Pinch the ends of the meatloaf closed and flatten them, transfer meatloaf to a tin seam side down, and cover with as much keto ketchup as desired. If you don’t have a meatloaf tin, place on a sheet tray seam side down. Bake for roughly 75 minutes, or until the internal temperature is 155 F. Remove from oven and allow to cool for 10-20 minutes with some tin foil tented on top. While the meatloaf is cooking, make the veggies by brining a medium size pot of water to a boil. Add 1 teaspoon of salt along with the broccolini and boil for 3 minutes. Meanwhile, cut the eggplant into large bite size pieces and slice the shallots and garlic. When the broccolini is ready, drain and cut into bite size pieces, set aside. Pour 3 tablespoons of oil int a large non-stick pan and heat on medium-high for 2-3 minutes. Once hot, add the shallots, garlic, mustard seeds, and tilt the pan so they fry in the oil. Cook just until the veggies are golden brown and then remove from pan but leave the oil behind. The shallots and garlic will burn easily, so make sure to pull them as soon as they are ready. Add the eggplant and broccolini to the pan, turn the heat up a notch, and cook for 5-7 minutes, or until the eggplant is golden brown and both veggies are cooked through. Add 1/4 teaspoon of salt, a coupe cracks of pepper, and turn off the heat. Mix well and add the lemon zest and juice, check for seasoning, you may need more salt or lemon. 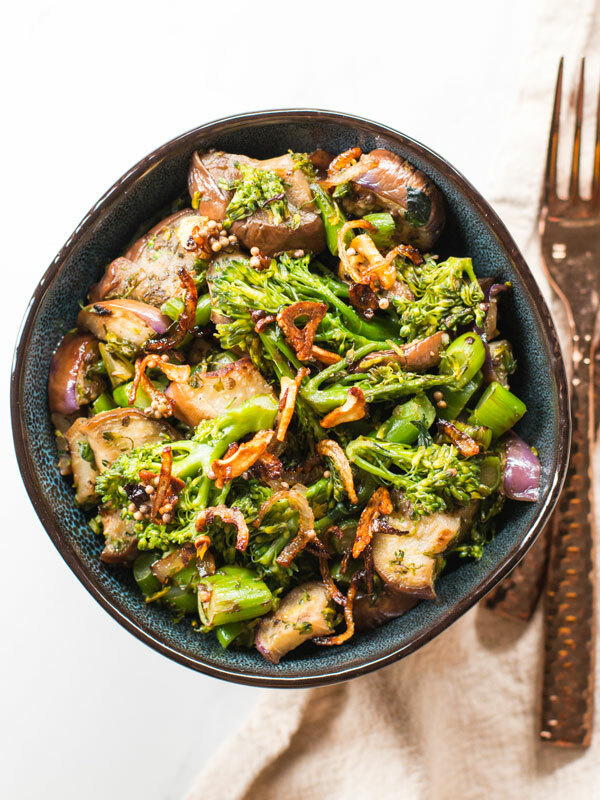 Transfer the veggies to a clean bowl and top with the crispy shallots, garlic, and mustard seeds. 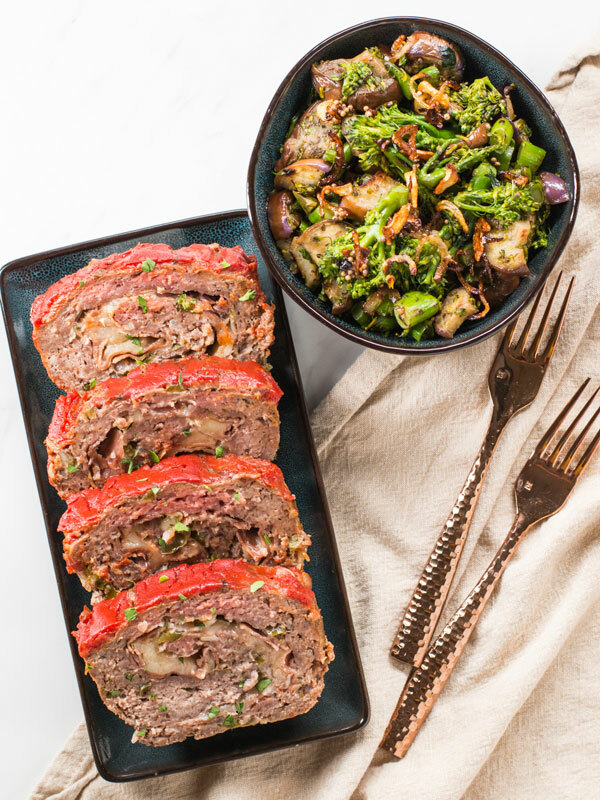 Slice the meatloaf and serve with the veggies, enjoy! Everything will keep in the fridge for 5 days or can be frozen for 2-3 months. The best way to reheat everything is in a 350 F oven for 8-10 minutes, if using a microwave, make sure to cover the container with a wet paper towel and don’t overheat the food, or it will dry out. Trying it today but one question is the veggies for a whole week? I just love every single recipe on this site. They are so creative and super healthy. I made this meatloaf today and it turned out just perfect! Love the combination between beef and prosciutto and cheese and ahhh. It’s just yummy!! Thanks so much Benny, so glad you rocked the meatloaf and enjoyed it! This was a delish crowd pleaser! So easy and but tastes complex. The best meatloaf ever! Easy to make and full of flavour. The side dish is a perfect pairing. Thanks Lucia, so glad you enjoyed the meal! I just got done making the meatloaf for the week ahead and I can’t wait to dig in. I did nibble a bit tonigjt itself and I had to stop myself from having a 2nd dinner 😀. This is an outstanding dish and Bobby really nails the flavors. I also love the simplicity of the ingredients. I was a tad apprehensive about my ability to roll the meat into the log but it wasn’t all that hard. Bobby’s instructions, both written and in the video are very helpful. Meatloaf isn’t a staple in my house but this meatloaf is going to change that. After the success of the base recipe tonight, I’m going to make this with different spices and cheeses. I also look forward to trying out more of Bobby’s recipes. that is great to hear Shantanu! Defo mix it up with other spices and cheeses, you will be a meatloaf master! This is amazing!! I also love how you throw in instructions on how to not mess it up, like cooking the veggies first or not to over mix! Please keep doing that cause this came out perfectly for me. Sooooooo gooooooooood!!! Just started keto, we found your site and so happy we did. The dishes are amazing in flavour and you make it so easy. Will keep telling everyone about you chanel. Thanks so much Kat..appreciate you spreading the word! So glad to hear it Ashley!!! So so so good! Made the meatloaf and veggies and loved both. I’m not an eggplant fan so I subbed for zucchini and it was still wonderful. The meatloaf was fabulous and the addition of the prosciutto and provolone was next level. Thank you Bobby- look forward to trying more of your recipes! Alexis, so glad to hear it!!! Keep on cooking! Where can I find broccolini to buy. HI Adelle, most big grocery store should have it. Have you tried Whole Foods?